Create online computer platform games for the extraordinary evolution of our species… or for total catastrophe… it’s our choice. People bring their expertise to public game-jam events through two imaginative world-forming activities: drawing and play. They swap their experiences and aspirations; they pinpoint obstacles to a good life, the tools and strategies by which these are overcome, and the rewards of success. In the process they create the resources and rules for polemical online platform games that can then be tested, remixed, relished and redistributed in epic play-sessions. The drawings created – avatars, background settings, obstacles, rewards – form the building blocks of computer platform games about places that people care about- full of local flavour. Afterwards anyone can join in online from their homes, workplaces, universities and clubs to remix, redistribute and play games, or to build their own from scratch. In 2015 Furtherfield is hosting game-building workshops at Furtherfield Commons, the community labspace in Finsbury Park, London N4. 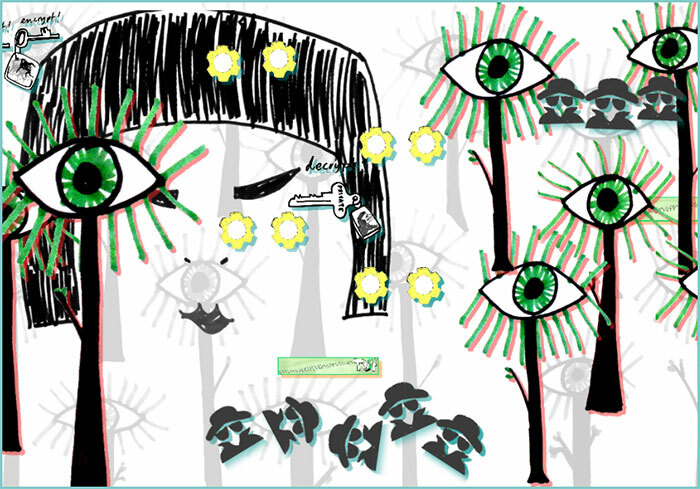 Play Your Place is an open digital artwork first published as a FOSS game platform to Github under a GNU Affero General Public License in October 2013. The game is developed by Soda with Ruth Catlow and Mary Flanagan (Tiltfactor, USA), using HTML5 to enable accessible, cross platform, in browser creation and play without plugins etc. 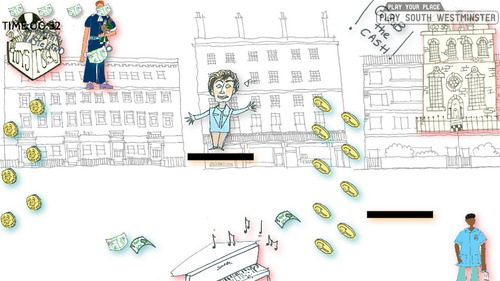 As part of the Web We Want Festival at Southbank Centre and Tim Berners Lee campaign for a Magna Carta for the web – 320 drawings by 200+ people and 4 new games. » Read the blog about the game which hopes to generate a collective vision for a better networked society. 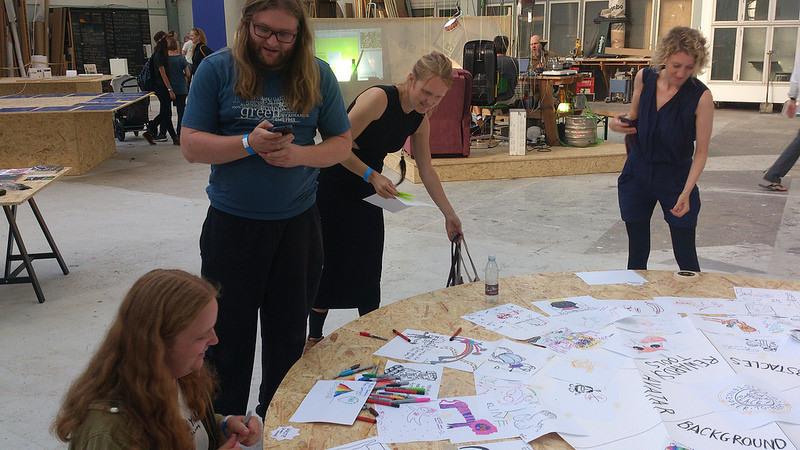 » Read the blog about festival visitors made drawings for a game where everything is decided and organized between peers. No state, no corporations. It’s down to us. Southwest Fest Gala Day, St George’s Square Garden, SW1V 3QW – 65 drawings by 45 residents and visitors inspired 4 new game levels. » Read the blog about the games built about what was most important to residents and then exhibited as part of the British Folk Art Exhibition, Tate Britain. Play Southend- since June 2013 – 2500 participants and 120 game levels. » Read the blog about the public events and the games that people built about the changes they would like to see in Southend on Sea. Play Your Place grew from conversations in the Essex town of Southend on Sea, between artists, writers, planners and residents about how people could better get involved in planning decisions in their town. This provided the focus for an artists’ residency hosted by Metal in 2010, with Ruth Catlow, Dr Mary Flanagan and author Rachel Lichtenstein (UK). Play Your Place is an open artwork and online multi-level platform game, for people to draw, make and play games that express their shared values explore their aspirations for the future of their locality together. Initially supported by Metal Culture, funded by Arts Council England East and Southend Borough Council in association with Furtherfield, Play Your Place has been commissioned by Tate, Peabody Housing Association and Southbank Centre. A research collaboration with Dr Harriet Hawkins, RHUL, has been funded through the Culture Capital Exchange Creative Voucher Scheme. Visit the blog for more information about the game.